Welcome to Part 2 of our Sesame Street series! In Part 1, (click here if you missed it) we told you how to get in for cheap (or free!). Now that you're ready to play, here's how to make the best of your sunny day! What's the perfect age to bring them? This answer depends on your kid. If you're only going to bring them once, a very-mobile age 2 is great. They'll have watched enough TV to know who Elmo is (and will probably be close to the apex of their Elmo obsession.) and they'll be able to go on almost every ride. There are a few faster "coasters" and swings that they won't be tall enough for, but almost everything else in the park and waterpark will be fair game. 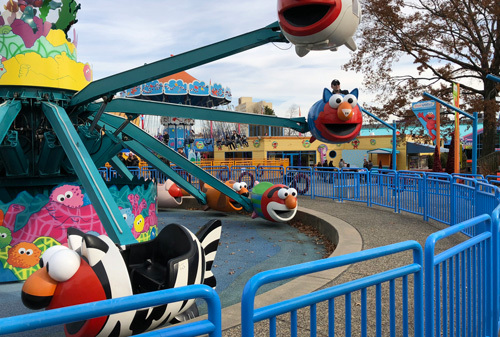 Earlier than age 2, and they can't experience most of the rides, and later on they don't freak out as much about Elmo, so a bit of that magic is missing. At any age it's a fun amusement park that's not too big, not too small, and best of all--no bratty teenagers! Or childfree people relaxing and having fun (the worst, amirite?). It takes us an hour and forty minutes to go from Westchester to Langhorne, Pennsylvania, which is just long enough for everyone in a car seat to get hungry and grumpy. Who wants to pull them out of the car and directly into a long line for security and admission, then more hot lines to get a glimpse of their favorite characters? Skip all that and have a #winning morning by booking a character breakfast. At $25 a head per adult—before season passholder discount—it's a little pricy, but the amount of problems it solves is worth every penny. (Or you can do what we do and bring extra tin foil and tupperware and take out enough food and dessert items for a lunch picnic in the park). Here's why breakfast with Elmo is the best: You get to walk into the park an hour early, way before the lines queue up. You get to take those groggy kids out of the car and stick food in front of their faces in a comfortable indoor space, so that when they are actually let loose in the park an hour later, they aren't hot and weary. The buffet is no Ritz-Carlton. It's very basic breakfast food, fountain sodas and juices, and cupcakes and cookies (cue the tin foil!). But it's all the stuff kids will eat. Elmo sets up shop in one corner and during the hour you can go visit with him as many times as you like and take pictures, or let the staff take pictures for you. While you're eating, other Sesame Street characters will come by your table to say hello. They don't guarantee anyone but Elmo, but the last time we were there, we were visited by Bert, Ernie, Zoe, Cookie Monster, The Count, and Abby. Big Bird tends not to be there. Maybe because of ceiling height? Having an hour to relax, unwind, and fill up before you head out into the park is amazing, and since they've met almost every character, you don't have to wait in the long lines at the meet-and-greet stations. Our little one visited Elmo three times during breakfast and was so excited to be able to be around him for more than the few seconds you get at the meet-and-greets. And once it's over you get to be among the first in the park to hit the rides. If getting there early's not your thing, you can also book lunch and dinner character dines. Our kids are so little we can't ensure they'll actually make it to lunch or dinner and be in a good mood, plus those are $5 more per person. Need more one-on-one time with Elmo? Those character dines can fill up fast! One fall weekend we were too slow to prebook and breakfast on the day we were visiting was sold out. I panicked—my kid was at prime Elmo-loving age, which unfortunately coincides with the age they can't wait in a line for more than 4 seconds without darting. I needed a golden ticket to Elmo! The customer service agent suggested an Elmo The Musical VIP Meet-and-Greet. $75 for ten minutes with Elmo, Cookie, and the dancing chickens might sound crazy, but once we got into the details, it didn't seem so bad. Hear us out! First of all, our party of 6 was about to shell out $125 for the character breakfast. so for $50 bucks less we could all eat yogurt in the car on the way there. We get a private meet-and-greet, which means she gets the characters all to herself for ten minutes (which is probably as long as her attention span anyway). There's a professional photographer taking pictures which are included in the cost. Actually, the $75 includes a single day Photo Key with unlimited downloads so any pictures you get in the park later are also free. That's a $50 value. We also got VIP admission to the Elmo the Musical Show. This isn't something I'd do every time, but if you're splitting with friends (for ten minutes you could even split it multiple ways and have one grownup come in with five kiddos), and want to take advantage of the Photo Key day pass, it's not a bad deal. I'm at the front gate! What can I bring? Sesame Place has a lenient policy towards things you can bring in. They allow soft coolers up to 10" x 10" x 12" and drinks and snacks. They don't allow booze or glass containers, or hard plastic coolers. They also don't allow "picnic lunches" but we've brought in plastic containers of strawberries, goldfish, granola bars, pouches, a diet coke can, water bottles, milk, baby formula, etc., and it was fine. You can bring strollers, wagons, life vests for the water park (though they have their own for free), even a pack n play (for that cabana rental?). This is more of a gray area. We like to be prepared, so our list might be a bit longer. Sesame Place is small, so if your child can walk longer distances, you might not need a stroller. We brought our sit-and-stand tandem stroller and our 3.5 year old barely needed to hop on the kickboard for a ride. You can't bring your stroller into the shows and it can only get so close to you at the water park, so keep in mind you'll have to be constantly ditching it. You'll want a non-valuables diaper bag that you can leave in the stroller with a change of clothes, some snacks, and other stuff you don't need to have with you at all times. We've never worried about theft at Sesame Place, but we're careful not to leave any valuables in our stroller. If you're visiting the water park, a waterproof necklace phone case that you put some cash and a credit card in will be the perfect thing to stay safe on the lazy river. And you can take photos through the plastic! If you're visiting in the fall, a small crossbody bag of valuables will do the job. Kids meals come with souvenir plates and cups. Bring some empty grocery bags to hold them. You may also want to bring tin foil or a tupperware container for any lunch food they don't finish. Those extra fries may come in handy an hour later when they are hungry again. If you're visiting the water park, your packing list will be a bit more extensive. Water shoes are recommended, and diaper-wearing kids who need to be in swim diapers at all the water rides (though we never saw anyone checking butts). You'll want to bring a bag for all the wet stuff, and some towels. Don't forget the hats and sunscreen! There's not a lot of shade to be found. Bring refillable water cups. You'll be able to get ice at the concession stands, and there are water fountains located around the park. You may want to anticipate your kids' impulse buy demands and bring toys or snacks that you can substitute for the high-priced items they'll see in the park. Our daughter always begs for popcorn and lollipops, so we try to bring our own. Bring a few reusable bags and a stroller clip in case you go shopping. The park hands out paper bags, which do not mix well with wet towels or sippy cups. Plus if you have to ditch your stroller, it's not shouting NEW MERCHANDISE INSIDE! Where to start? Water park or theme park? Once you get inside the gates, you can go left for the water park attractions or right for the theme park attractions. There are two schools of thought on this. If your kids like specific rides, and those lines fill up quickly, you may want to head straight for the amusement park side. But keep in mind you're going to get hot and sweaty pretty quickly. If your kids are like mine and only like the rides with little to no lines, and can turn from having-a-blast to get-me-out-here in five minutes, you may want to start with the water park. That way everyone can stay cool and run around until they get tired. Then you can get them changed before meltdowns happen. Have a quick lunch, then hit the amusement park side. When they go from hero to zero, they'll already be dressed, fed, and ready to leave. You can make a quick exit. You may get sweaty again walking around theme park, but at least you'll have the sweet salvation of an air-conditioned car to look forward to. Theme park parades always seem to have a cult following. Be it Disney World or Sesame Place, you'll see people sitting along the route hours before the parade. We've heard they are fun, but we have two impatient, easy-to-overheat toddlers, and sitting on a blanket in the sun while nothing happens is the opposite of what they can tolerate. Sesame Place parade viewers are a more chill bunch than Disney, however (we once got scolded by a Disney parade fanatic who wanted their spot in the shade by the fence to include the entire ten feet of lawn in front of them, too). It seems like there are a lot of spots to get a great view. But if you don't want to wait, for $20 a head, you can buy your way in to the Reserved Parade Viewing Area. Just select the date and time online before you go, and you'll get your own priority viewing area. Keep in mind THAT area is first-come-first-served, so if you want to be in the front of the front, you still have to arrive early. For sale along the parade routes are bubble machines, light-up wands, and all sorts of toys that are both expensive and tantrum-inducing. Ward off a case of the gimmes by bringing your own small bubbles or some glow sticks. Spending $2 ahead of time can spare you $20 later. The same goes for sweet treats. If you bring a small lollipop for the afternoon meltdown, you won't be guilted into buying a $5 huge one later on. There are usually three different variety shows that repeat daily throughout the park. They are short with open seating, and they are a great way to find out if your kid can handle a show before you shell out for Disney Live tickets at the County Center. If they melt down, it's easy to head out. And if they love it, well, there are shows every hour. Have fun! If you buy one of those all-you-can-drink cups and the lines are long at the concessions stands, you'll want to seek out a self-service refill station. There is one inside Cookie's Sometimes/Anytime Food Market. There's also one on the upper level of Cookie's Cafe, but sometimes it's turned off. All the self-serve refill beverage areas have water, and the staff is chill about you refilling kiddie cups with water and ice. There are also a few water fountains around the park. There are a lot more dining options in the summer, when Captain Ernie's Bistro and Grover's Island grille open up. The two main eateries are Emo's Eatery, with what they call "modified table service" (think Panera) and Cookie's Cafe, which operates like a buffet line. We find it the most mellow to eat at the upstairs mezzanine at Cookie's Cafe, which is roomy and never gets too full. There's an elevator to get your stroller up and plenty of high chairs. Free shuttles to the park! If you don't want to deal with the $20 parking fee and are planning an overnight stay, several local hotels offer free shuttle service to and from the park. Just be sure to ask about the hours. If you booked a character breakfast, they might not be able to bring you into the park an hour early. Click here for the list of hotels with shuttles. On the season passholders preview day, we visited the park and picked up an unlimited beverage and popcorn bucket good for free refills until the end of 2018. When we had one kid, this wouldn't have made a lot of sense. We packed the cooler with some diet cokes and brought our own snacks. Then we'd hit up a drivethru on the way home for some caffeine for the adults. But two kids means double the stuff and double the breaks (ours like to tandem tantrum), and in the summer with towels, suits, and water shoes, you have even less room in the stroller to pack a soft cooler with enough in it to make everyone happy. There's no way we can avoid in-park purchases unless we turn ourselves into (sweaty) pack rats. We gave up. $53 later we had popcorn and drinks for everyone all day long until 2019. Getting the refills takes up time because you have to stand in line for the popcorn (see above for where to DIY your soda refills), but we can get the kids juice, ourselves soda, and everyone can snack on fresh popcorn all day long. It was a life saver right after the water park when we had to get everyone dry and dressed before lunch. The popcorn bucket kept them happy till we could get into an air conditioned cafe. And the beverage bucket kept the adults perky and hydrated all day long. Soda, juice, and water are about $3.50 and popcorn is about $5. So in two trips this has already paid for itself. If you want the convenience of fresh food and drink on command, go for it. Otherwise you can totally make a soft cooler and bag of snacks work for 1/5th the cost, especially if you plan to visit less than five times. Sesame Place has both. There are changing tables in every bathroom, but these can get busy...for the women's side. If hubs can step up and change the baby in the park, he'll have no wait and near-immaculate amenities (this trick works in almost every public venue). I can't count how many times my husband has returned from changing the baby in public and said "I think I was the first person ever to use that changing table." Meanwhile the line for the one women's room table is out the door. Tell him you'll pay him back by changing your fair share once you get home. If you're doing the waterpark with more than one kid and one adult, pack each child their own changing bag with fresh diaper/underwear, wipes, clothes, and towel, so you and your partner can split up and save time in the changing room. It can take forever to take turns, passing the one changing bag back and forth between you. There's only a few places to get ice cream in the park, and once the day heats up, the lines can be pretty long. Plus the portions (and prices) are large. 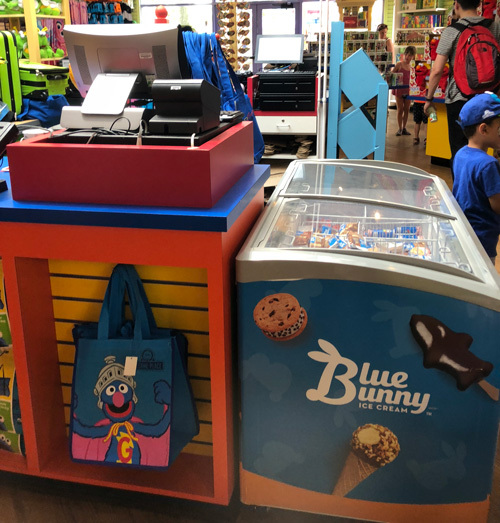 Skip all that by heading to to Mr. Hooper's Emporium and finding the ice cream cooler next to the cash register in the middle of the store. It's not fresh soft-serve, but you'll find kid-friendly pre-wrapped ice cream treats and you'll be in and out before you can say "Ice cream cookie sandwich". There are two designated meet-and-greet spots. 1-2-3 Smile With Me! is a tented area with one line for two sides, each side containing one character. When you arrive at the park, grab a map and flip it over to see the times and places for your favorite characters. You may want to show up a few minutes early, as the lines can fill up quickly. Bring your stroller unless you have the most obedient, still-standing kid. Sesame Neighborhood is an area of the park that's outdoors and mostly unshaded. If you're waiting in the area, be sure to bring hats and sunscreen. There will be "professional" (read: college students with Nikons) photographers taking photos of you, but you can absolutely take your own photos. Just coach your kids to look at Mommy's phone so all your shots don't feature them looking left or right at the other camera. The photographers can be friendly about taking pictures with your phone if you want to be in it, but I usually ask the people in front of or behind me if we can team up to get a picture of the whole fam. If you go with the photographers' photos, you'll have to buy them later at about $20 a pose or $50 for the whole day, but as I wrote last week, it's not a great deal. Click here to read last week's post and see why. Additional characters not listed on the map also roam around the parks in the sections labelled "Sesame Plaza" and "Sesame Neighborhood." In the fall and winter, the waterpark areas are re-designated as character meet-and-greet areas, so you can see more characters in less time if you visit after the summer. Of course, you can see everyone if you wait for the parade, but you won't be able to stop them for a photo. Shows are another fun way to see the characters from a comfortable position, but they won't hang around afterward for photos. Our favorite way to see most of the characters (as we mentioned above), is to book a "Dine with Elmo & Friends" meal. What's the deal with Julia? 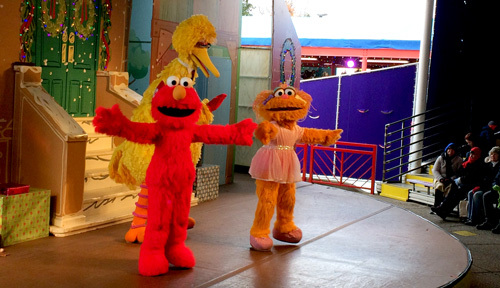 Sesame Place's newest character is Julia, a "sweet and curious 4-year-old with Autism". Read all about her here. Julia made her debut in the park last season, and on TV Elmo and friends learn about how Julie does things, “in a Julia sort of way.” Julie is around the park for character meet and greats, but keep in mind she does stay true to character the entire time. We went with two over-eager 3 year olds and were held back from taking a picture with Julia because the kids were too ramped up. Julia's handler made sure we were calm and approached her gently and without too much noise. If kids are noisy, Julia and her handler move to a corner to wait it out till everyone calms down. If you have a child who is too young to modify their behavior in a stimulating setting, you may want to focus on the other Sesame Street friends, but with a little pep talk, most kids will be just fine taking a photo. 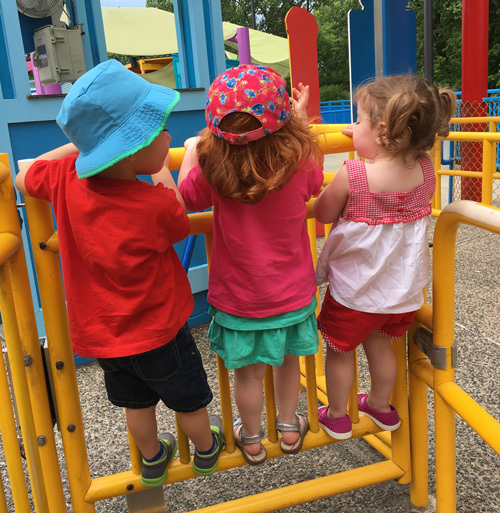 Meeting Julia at Sesame Place is a great way for kids to learn about empathy and how their behavior can affect others. Click here for more info. Sesame Place has recently become a Certified Autism Center, meaning that their team members receive training sensory awareness and other issues. While the entire experience of the amusement park might not be sensory friendly to every child, they have worked to develop a IBCCES Sensory Guide which provides insight on how a child with sensory processing issues may be affected by each sense for rides and attractions. You can enroll your child in the Ride Accessibility Special Access Program which allows them priority access on rides, and download their Ride Accessibility Guide. Guides with sensory needs are also encourage to check out two new Quiet Rooms installed in the park, or borrow Noise-Cancelling Headphones, available at The Family Care Center or Welcome Center. That's it for this week! Like what you're reading? Help keep the computer screen on by following us on Facebook or Instagram and signing up for our weekly emails at BabyGotChat.com. And as always, check our website for events and our easy-to-navigate chart of every weekly kids library program in Westchester. Just be sure to check the date you wish to attend against the library's calendar, because many programs are wrapping up for the school year.